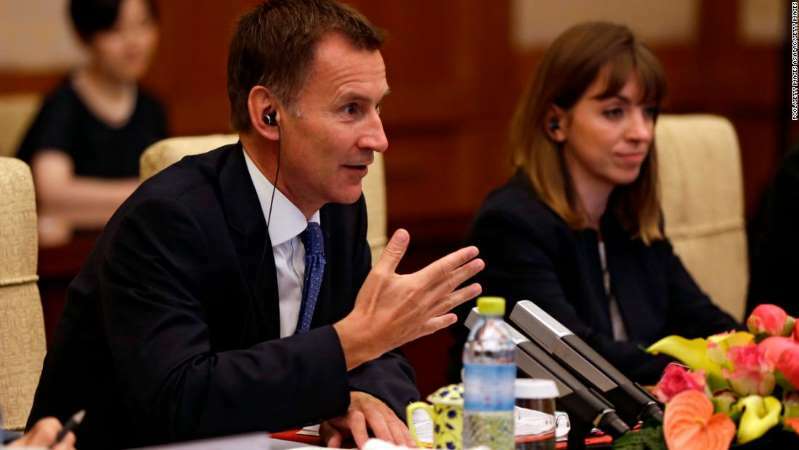 UK Foreign Secretary Jeremy Hunt has made what he described as a "terrible mistake" on his first official visit to China, accidentally describing his Chinese wife as Japanese during a meeting in Beijing on Monday. "My wife is Japanese -- my wife is Chinese," Hunt said at talks with prominent Chinese leaders, including Chinese Foreign Minister Wang Yi. "Sorry, that's a terrible mistake to make," Hunt quickly added as the group erupted in a fit of laughter. [post_ads]Hunt attempted to minimize the damage by demonstrating knowledge about where his wife's family lives. "My wife is Chinese and my children are half-Chinese and so we have Chinese grandparents who live in Xian and strong family connections in China," he said, referring to the northern city, one of China's ancient capitals. Hunt is married to Lucia Guo. They have three children. Relations between Japan and China have been strained for years, with bitter territorial disputes over islands in the East China Sea and long-running grievances dating back to World War II a factor. Hunt is in Beijing to explore possible talks on a trade deal with China following the UK's exit from the European Union. It is the first major overseas trip for Hunt, the former health secretary, in his new role, and he appeared to be following in the footsteps of his predecessor, who was known for gaffes and insults. Former foreign secretary Boris Johnson, who resigned in July, has a longstanding reputation for colorful language, ranging from minor slip-ups to offensive comments about other nations and their leaders.